The boys last saw illusionist Joe Labero perform a double levitation act in Resorts World Sentosa's Incanto in 2013, and somehow they never forgot that. So when the three-time recipient of the Merlin Award returned in the beginning of this year with a brand new fiery show, I knew they would lapping every single trick. 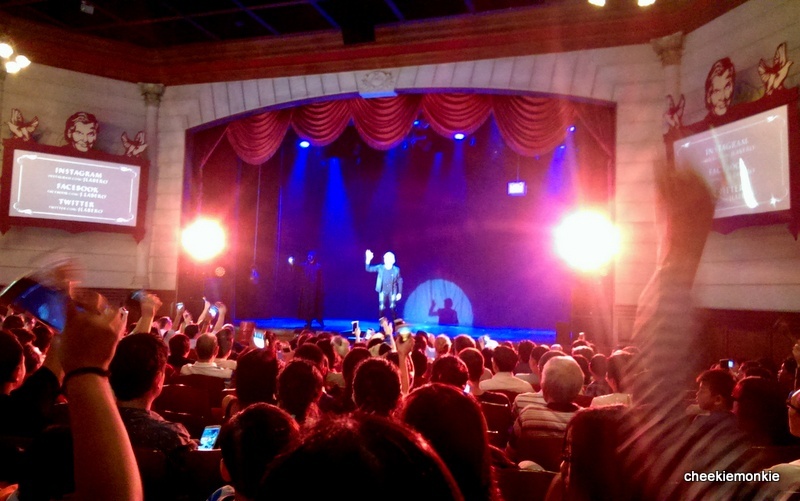 Turned out that we were not able to make it for the earlier shows but thankfully, A Night of Magic at Raffles was such a success that the show got extended until 3 May! And yes, we were able to make it this time around. I do not want to give anything away but let's just say I had a headache trying to figure out how on earth did Joe Labero perform his illusions. I just do not know how he does it. I watched his every movement on stage and off stage while my brain went into overdrive mode thinking of various scenarios of how the magic could be done but I had no answers. For the monkies, they were left spellbound in their seats with wide-open mouths as Joe seemingly disappeared, smashed up an audience member's iPhone and poured an endless stream of water from a jug. Sure, some of the tricks were not new but Joe executed the magic staples with such charisma and great showmanship that it was difficult not to be fully absorbed in the performances. Oh, and stunning performances by guest performers and fire artists, Burnt Out Punks, complemented the show very well indeed. I saw a fair number of children in the audience, and listening to some of the the comments from them - and my own monkies - during the show was quite funny. There were no over-the-top 'scary' moments like huge explosions or loud sounds so I would say it is definitely a show that you could take kids to. Just be prepared to explain to them how the illusions were done after the show! If you have the answers, that is. Enjoy a 'BUY-1-GET-1-FREE' offer when you purchase your tickets from SISTIC! Just enter 'MAGIC' as the promo code.